Attention: this boat may be built only with a numerically cut plywood kit or with full size patterns provided by one of my partners. Due to the large quantity of required plywood panels, we recommend to choose the kit. I have built my Beniguet between 2012 and 2014 from a marine plywood kit. You can take a look at my blog for the building process, but the tekst is in dutch, at http://beniguetmarie.blogspot.nl/ . I had no experience in boat building, but the plans and building guide supplied helped me getting through. As well as some advice from Bert Reijntjes, “de bootbouwer”. It took me a lot of time, and by that a mean it gave me a lot of fun. I didn’t actually count the hours, maybe even some 2000. But then, that is including some things I did the wrong way -stupid me- and had to do again, and some inefficiencies. And as I had quite some sailing experience, and therefore some special wishes, there was some extra work as well. I had great expectations as we launched her in may 2014. But she behaved even better. It is a wonderful boat to sail and quite seaworthy. She is small, but that is an advantage as well. This spring we went to Morbihan week, a thousand kilometers drive with the boat behind our 15 year old VW golf, and an equal distance back home, with no problems at all. 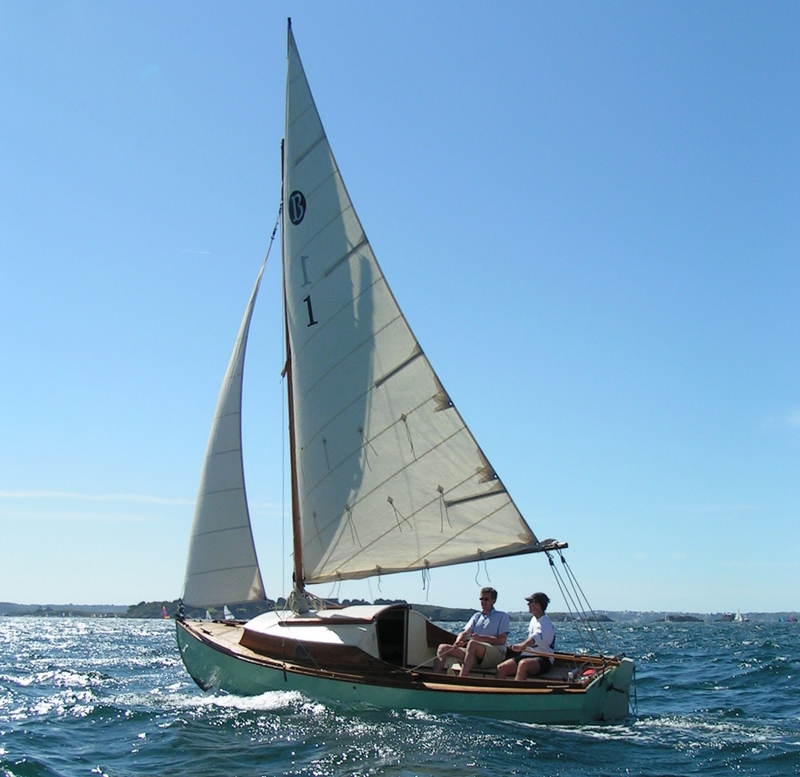 Launching is easily done with a little inexperienced help, and I can sail her alone if I want. She accomodates two for sleeping, four on day trips. And she is often commented upon admiringly, especially for her beautiful lines. You may wonder if this doesn’t sound too positive. Yeah, maybe it does, but I was very happy building her and equally happy with the result. So Francois Vivier, thanks for a wonderful design well translated in thorough building plans. Negative point? Sure, the exact same. She is small, but that is a choice. I’m happy living for a week aboard, but there is, obviously, no place for a shower, so it be a swim instead (I do have a solar camp shower aboard, but that takes to much of my drinking water supply). Her speed naturally is related to her size, but I get regular comments that she is faster than expected. In good wind expect a max of 5.5 knots, but on one occasion I exceptionally clocked a GPS speed of 7.4 knots (no current, I once had 9.5 knots speed on tidal waters, but that is something else). And yes, if I sail on the IJsselmeer, a 1100 km2 stretch of relatively shallow water and therefore often nasty short waves, she is slowed down considerably on windward headings. But those things are only to be expected, and largely outweigh the advantages of being small, like easily going everywhere, trailerable, easy to handle and to store. And a bigger building project wouldn’t have fitted in my shed anyway. And those windward bits are also great fun sailing.